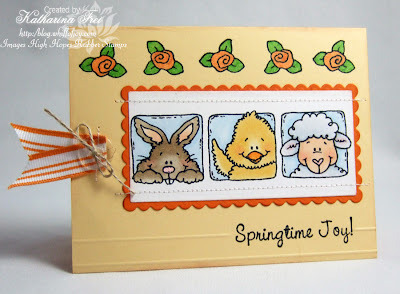 Those 3 cute fellows are perfect for any kind of spring or easter card. I coloured them in a second with my Copic Sketch Markers. border 1: I used the small High Hopes rose from the ribbon rose set to stamp a border and coloured the roses with Spica glitter pens. border 2: the main image is matted with a long scalloped rectangle from Spellbinders Nestabilities. border 3: I sewed some additional borders around the main image. border 4: I scored two lines next to and below the sentiment. Die 3 süßen Tiere sind perfekt für alle Arten von Frühlings- oder Osterkarten. Ausserdem habe ich sie in Null komma Nichts mit meinen Copic Sketch Markern coloriert. Rand 1: Hier habe ich die kleine High Hopes Rose von dem Rosenband Set verwendet um eine Reihe zu stempeln. Coloriert habe ich sie dann mit Spica Glitzerstiften. Rand 2: Das Hauptmotiv habe ich mit einem gewellten langen Rechteck von Spellbinders Nestabilities hinterlegt. Rand 3: Mit der Nähmaschine habe ich noch einen zusätzlichen Rand ober- und unterhalb des Hauptmotivs genäht. Rand 4: Entlang und unterhalb des Textes habe ich 2 Linien gefalzt. Ich danke euch fürs Reinschaun und genießt noch den Rest vom Wochenende! Paper: Su cardstock "barely banana & pumkin pie"
Wow, die Karte ist wunderschön! Die Gestaltung ist genial! You certainly did a nice job with the borders. The stamp is so perfect! Hi Katherina Beautiful card and those images are so cute. What an adorable card!.. You did an awesome job on stamping and coloring in. Wished you lived near me so you could teach me how to color in stamps. Awesome card! I love all of your creative borders! And this image is just so cute!